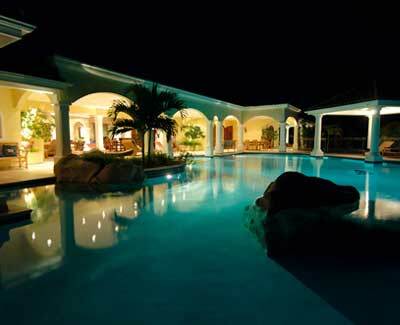 This elegant villa in Terres Basses offers a magnificent free-form pool just steps from the Simpson Bay lagoon. The grand living room opens onto extensive covered terraces. This villa has a sophisticated blend of modern, colonial and tropical style furnishings. The four bedrooms with King beds open onto the terraces, the fifth and sixth bedroom have twin beds. All windows are fully screened.Each bedroom has a private bathroom with shower as well as a tv and dvd player . The very spacious and fully equipped kitchen offers a view on the pool and the lagoon. An outdoor dining area is located in the gazebo adjacent to the pool and the beach, and is equipped with a gas grill.